It is quite interesting to add sounds and recorded voices into your projects or interactive devices. 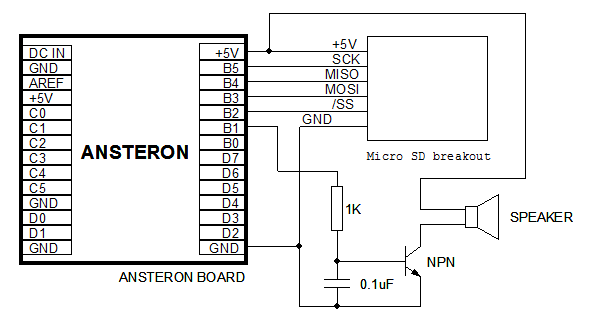 Ansteron Board is capable of playing audio files in WAV format with acceptable quality and easy to program. The combinations of different sounds in multiple files can create many sound effects for your projects. Output signal is fixed to pin B1. While Wav file is playing, PWM functions on pin B1, B2, B3 and D3 cannot be used. Besides, TimeStamp library cannot be included. If an audio amplifier is used, connect pin B1 to the input of amplifier though a RC filter. Wav player library supports files with 8-bit mono PCM format. The default sample rate is 16 KHz but files between 11 KHz and 32 KHz can be played. Audio files usually need to be converted into appropriate format before Ansteron Board can play them. There are many software to do this, either free or commercial. You can search and download them on the Internet. Note that Wav player library support mono (1 channel) audio only. Beside audio files you got online or from CDs, you can even record them using software on your computer such as "Sound Recorder" (included in Windows). They can then be edited (cut/trimmed) with other software like Windows Movie Maker. Wav files can also be created from other audio formats (mp3, wma...). 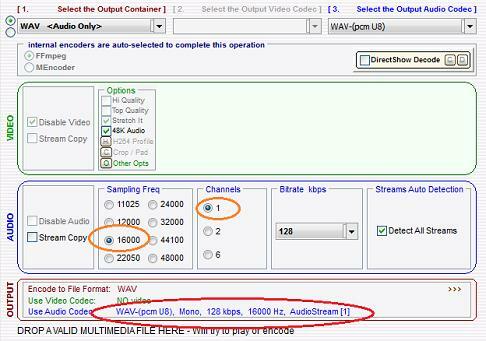 To play Wav files in your program, you will need to have a buffer for temporally storing of audio data. This buffer must be between 256 and 1024 bytes in size. In the example below, a buffer of 512 bytes (char buffer;) is created in global variable section and passed to WAV_player() function when it run. The buffer can be used for other purposes when not playing. User program has to set sample rate for each file before playing if it's not 16 KHz. However, playing Wav files at a different sample rate than it is can create some good sound effects as well. To change the sample rate of WAV player, use function WAV_player_sample_rate(rate) where rate can be one of the following: SAMPLE_RATE_11K, SAMPLE_RATE_16K, SAMPLE_RATE_22K, SAMPLE_RATE_24K, SAMPLE_RATE_32K. Wav player library relies on SD Card library. It must also be included in your program. Function WAV_player() will not return until given file is finished playing. To stop playing in the middle of wav file, an interrupt must be used. Your program can set up an external interrupt or any of the available interrupts before playing wav file. Function WAV_player_stop() is called in the handler to stop Wav player.